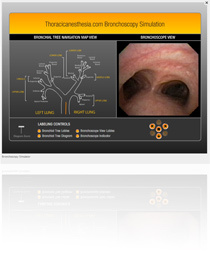 Welcome to the Bronchoscopy Simulation section of www.thoracicanesthesia.com. Using real time video, the simulator has been developed to help teach and review bronchoscopic anatomy. With this knowledge the anesthesiologist can improve upon their lung isolation management skills, leading to improved efficiency and safety. To access the simulator, the user is first asked to complete a brief questionnaire about the airway with multiple choice questions. It should only take a few minutes to answer. The simulator is then accessible indefinitely (see instructions below). After using the simulator, the user will be asked to answer the same multiple choice questions and this time all the answers will be given. It is our hope the entire process will leave the user with a new appreciation of the anatomical features of the tracheobroncial tree. Navigation is accomplished by clicking on the arrows in the Navigation Arrows section. It should be noted that in each part of the airway, only the highlighted arrows are available for movement. Bronchial Tree Navigation Map: The user can follow the path of the bronchoscope on the Bronchial Tree Map. If desired, labels on the map can be added or removed by clicking on the Labeling Controls below the map. This allows the user to test their knowledge. Zooming in on the map can be done by adjusting the Diagram Zoom bar on the left. The map itself can be moved by clicking and holding on it with the left mouse button. The mouse can then be used to position the map where needed. Bronchoscope View Labels: When the Bronchoscope View Labels are enabled, the user can point the mouse pointer over each label on the video in order to read a “learning point”. These labels provide anatomic clues to help learn the bronchoscopic anatomy. Click here to enter the simulator. The simulator requires Adobe Flash Player 8 or later.